Discussion in 'Fun and Notables' started by Bro.BruceBenjamin, Mar 31, 2011. 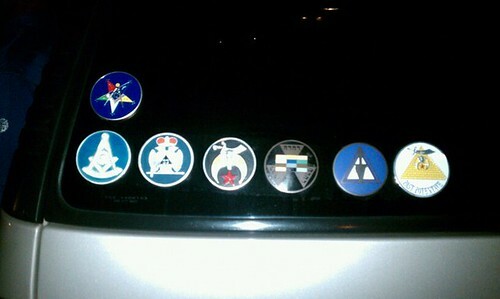 If your car or truck looks like this you aint got no time to find nothing else to join! So, what is the proper protocol? I'm looking to hear the opinions. I made an attempt to do something similar. I posted them in the order that I joined them, left to right. Unfortunately in Texas, those very decals/emblems will not last through the hot summers that we have here. I have spent WAY too much money replacing those emblems as I see them fall of or slide down a window or bumper... I finally gave up and reduced myself down to a simple Square and Compasses tail light decal (one) on the rear window of my vehicle. Not only would I NOT have enough time to do anything constructive in any one of those bodies, I couldn't afford the DUES! LOL. Unfortunately in Texas, those very decals/emblems will not last through the hot summers that we have here. Very true, Bro. Stewart. I am very glad that all I have right now is my S&C and my Scottish Rite emblems. I was looking at them the other day and was wondering if there were any better ones that don't start to slip and fall off? I had to replace my S&C a couple of times, but this will be my first summer to have the Scottish Rite on my widow. So, does anyone know of any that can actually last really well here in Texas? I have ordered off of several different sites, and even ordered from the merchandise sales people here in Texas and none of the adhesives hold up to the heat here in Texas. That is why I like the vinyl die-cut decal that is normally purchased for the tail-lights. The decal shows up fairly well on windows especially if they are tinted. I believe that there are a couple of online retail places that make the AASR die cut vinyl decals similar to the popular Square and Compasses version. I have ordered off of several different sites, and even ordered from the merchandise sales people here in Texas and none of the adhesives hold up to the heat here in Texas. Thanks. I have thought about using those vinyl decals for the taillights on my window, but I really like the size and design of the ones that are similar to the ones that are pictured on the original post for this thread. Let me ask you this, Bro. Stewart. Do you know of a site or any place to get the ones that are like what is pictured but that the money actually goes to a Lodge, a Masonic entity, or even a charity? I don't think that I would mind paying the $3-$6 a pop every several months or 1-2 years if I knew the money was going to something like that as opposed to some person trying to make a profit only. I also have a friend of mine that owns his own sign business. I'll ask him what kind of adhesive would be the best (especially for the money) and see what it would take to make some up that can really hold up to the Texas heat. That way, I can either get some made and get them to some Brothers, or at a minium have some specifics to ask when ordering from an online company to make sure it is the best quality. I also have a friend of mine that owns his own sign business. I'll ask him what kind of adhesive would be the best (especially for the money) and see what it would take to make some up that can really hold up to the Texas heat. That way, I can either get some made and get them to some Brothers, or at a minimum have some specifics to ask when ordering from an online company to make sure it is the best quality. I do not know of a site that directly contributes to a Lodge etc., but there are several that are operated by Brethren. I have been told that the best adhesive is made by 3M. However, this is the same brand used by the local TX merchandise committee. The 3M does last longer, but in the end you get ultimately the same result. http://www.freemasonstore.com/index.php is owned by a Brother, I have ordered several items from this e-store. i personally prefer the vinyl ones anyway. They look really cool on the tail-lights and they seem to stand up really well. I had a S&C on my truck for 2 years (before i totaled it) and tbh, it outlasted some of my regular bumperstickers. Right now, I just need to worry about getting a new vehicle to put stickers etc. on! Hahaha, I do not have any decals yet but have had prior stickers and such literally melt off. The tail light decal does work great on a window. it looks great and really sticks out. I've thought about putting the GLoTX sticker for the current year on there and switching them out.